When people think about skylight installation, they tend to focus on a specific type of structure or space suited for it, like rooftop windows that are the perfect addition to a loft or an attic bedroom. 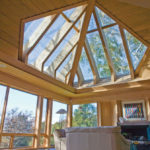 However, recent innovations and developments in building design and materials mean that today, residential skylights can be located almost anywhere in your home, highlighting and transforming any space. As a leading residential and commercial skylight contractor providing both installation and skylight replacement, we deliver many different, innovative skylight solutions that can make an impact on your property’s lighting and ambiance. If you are looking to brighten your home with natural light, but aren’t considering skylight installation in one of the typical spaces such as an attic, the good news is that skylights don’t need to be confined to the upper story of your home anymore. A recent innovation that’s proving popular with homeowners across the Bay Area is tunnel skylights. These skylights are so named because they use tunnels lined with reflective surfaces to funnel light from the outside into spaces that otherwise wouldn’t have access to natural light. This means you can have skylights that are built into rooms on the ground or first floor, providing a great source of natural light exactly where you need it. A skilled skylight contractor can make all the difference with this type of skylight installation, and Mares & Dow has years of experience in installing this stunning skylight option – just give us a call and we’ll be happy to discuss your project with you. Velux is a trusted name in skylights, known for its quality, reliability, and versatility of multiple skylight solutions that can meet any commercial or residential lighting need. From traditional to modular to tunnel skylights, Velux has a variety of products, offered with the Velux warranty. As a preferred Velux supplier and installer, general contractor Mares & Dow is as invested in the quality of the materials we source as we are with our workmanship. This means we are able to install skylights from the prestigious Velux range, ensuring our customers benefit from a quality product that will provide them years of excellent service. As a skylight contractor with over thirty years of experience, we are able to successfully undertake a wide range of building and remodeling projects on properties of all shapes and sizes. Whether you are looking for a skylight contractor because you want to transform your home with skylights or have a different job in mind, our friendly, professional team will be able to get the job done at a very competitive price. To find out more about skylight installation or skylight replacement, contact us today.